Get ready to experience the groovy sights & sounds of the Sixties, from both sides of the Atlantic! First, you may hear songs by iconic British Invasion groups such as The Zombies, Dave Clark Five and Herman's Hermits. The American "musical response" follows, with memorable hits by celebrated artists such as The Monkees, Tommy James, and The Doors, to name just a few. The performance concludes with an extraordinary finale paying tribute to the four lads from Liverpool who started it all, The Beatles! 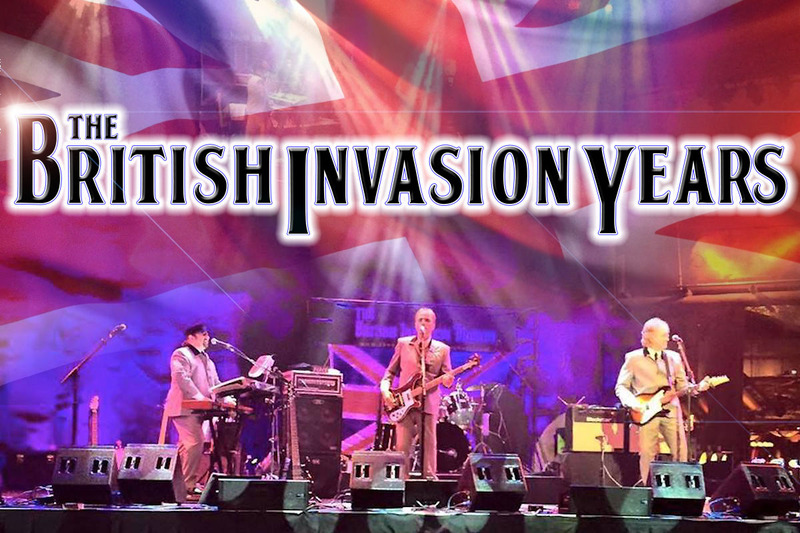 The British Invasion Years has shared the stage with legendary recording artists such as: The Beach Boys, Ringo Starr and his All Starr Band, Herman's Hermits and many, many more! One night, after collaborating on another project, these best of friends developed the concept of an exciting, unique concert experience, meticulously recreating all the amazing hit songs they grew up listening to, complete with period accurate outfits and multimedia. Bobby & Lee had worked on other musical endeavors along side seasoned keyboardist/guitarist Jon Wolf. Jon had caught wind of their idea and wanted in. He dropped "subtle hints" at sessions, like randomly playing pieces of The Beatles' Abbey Road medley. Well, Jon's plan worked! He got their attention alright, and was immediately brought on board. Bobby and veteran drummer Dave Hall have been longtime friends, as well as members of a wildly successful regional club band a number of years back. Lee and Jon also knew Dave and had always wanted to work with him. Turns out, Dave felt the same way. When the band was searching for a drummer, Dave just happened to be available at the right time. So he enthusiastically answered the call and joined forces with his other three friends. With the lineup now complete, the group that would soon come to be regarded as the "Four Boys Making All That Noise" launched its musical "invasion"!